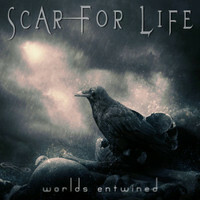 SCAR FOR LIFE is a Hard Rock band from Lisboa in Portugal formed in 2008. In 2013 Rob Mancini (HOTWIRE, CRUSH) joined SCAR FOR LIFE as their new lead vocalist. On 29th August will be available their fourth album „Worlds Entwined” featuring a number of special guests such as Vinnie Appice (BLACK SABBATH, DIO), Neil Fraser (TEN, RAGE OF ANGELS), Michael Carlsson (LOVER UNDER COVER) and Anne Victorino d’Almeida. Album was mixed and mastered by Swedish producer Martin Kronlund at JM Recording Studio Sweden. Opening track „Thirteen Revolution” is great opener with lower and strong guitars in BLACK SABBATH style with melodic singing and incredible guitar solo! I like so much “Fire And Flame” where sounds are so fantastic, melodic sounds in Hard Rock spirit with memorable refrain, and titled track “Worlds Entwined” where beautiful climate is building with fascinate voice and heavier riffs with big dozen of melody. So interesting is “Because I can” with powerful sounds, pulp of drums and heavy guitars. The best is melodic singing choir which add a flavour to this song. Nice ballad „Wish You Well Tonight” shows wonderful calm climate and fine singing, incredible ballad “My Dark Serenade” has also connection of calm and stronger style. Worth to mention are: „Disconected” with rockin riffs in 80’s years and amazing guitar solo, “Promised Land” with amazing sounds and SCORPIONS influences in chorus, melodic “Vendetta” in ballad style, “Judgement Day” with heaviness and BLACK LABEL SOCIETY similarity in guitar solo, and powerful “Carlos Wonder” with AOR nice sounding echoes. I can't wait to listen new songs from SCAR FOR LIFE, and I'm sure that this album will be amazing to listen to for lovers of Melodic Hard Rock with massive sounds. Everyone will find something for yourself. Production of the album is on high level. It’s very enjoyable and you can feel the experience of the musicians. Every song on this Cd is more than worth to listen. The whole album is full of melody & great done musically! They are drawing handfuls from the Rock music. That's why this CD is sincere recommend!